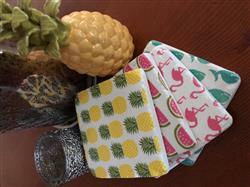 We love the cute mix of pineapples, flamingos, watermelon and whales in this bright 4 coaster set! Includes four different designs in each set. This colourful and warm coaster set will brighten up any surface with its cheerful look and protect them at the same time. The aged, rustic finish looks particularly effective when used on wood tables and benchtops. I absolutely love my coasters and everything else I purchased. Blissful experience and I highly recommend them.